From a simple stroll to an adventure to the edge of the island, there's a walk for every being. We'll point you in the right direction. A rocky beach known by locals as a spot to catch surf, Kapanaia Bay is where the river meets the ocean. Take a dip in freshwater, or plunge into the salty seas. Tucked away at the base of the retreat property, lie Hapu'u Bay. A quiet, peaceful bay, lined with Beach Almond trees and native flora. Rest on a fallen log and enjoy the view of the Pacific to the north. 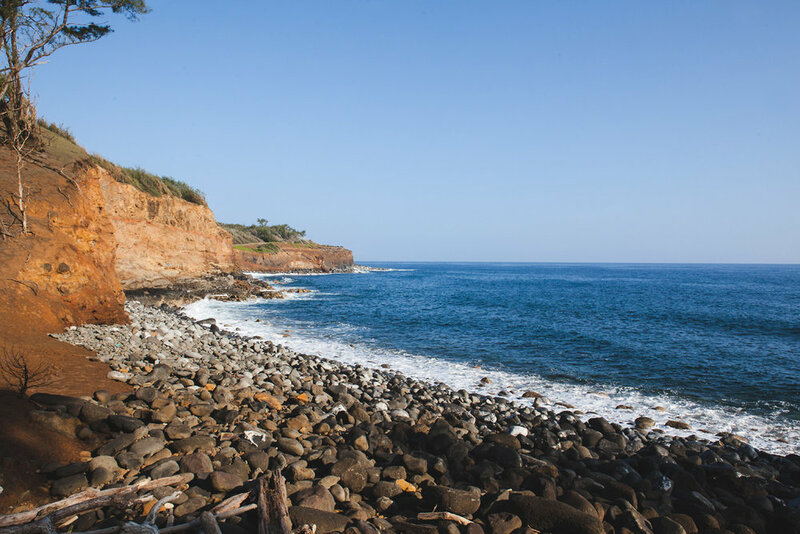 Explore 7+ miles of the Kohala Coastal Trail System. Following the rocky coastline, sandstone bluffs and expansive views line the walk. High grasses, windswept trees, and historic heiau are all found along this peaceful trail. Bathe in tidal pools right on the edge of the coast. A rope guides you down to the "Mermaid Ponds," or "Queens Baths." This area is filled with aquatic life - from black crabs to bright tropical fish.